It hit me this week that, uhhhhh, Halloween is like, in two days and I hadn't shown you more of my decor. Maybe you can file some ideas away for next year, yes? Most of my Halloween decor -- well ALL of my Halloween decor -- was made by moi or purchased on the cheap. I showed you my free spooky mantel here, my ghouly candleholders here and my Halloween crafting here. All were super cheap or faaaareeee! Here's more of the other el cheapo decorations I promise every one of you can do! 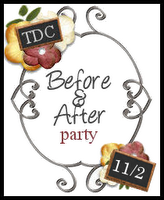 Another Before and After Party is coming up this Monday!! (I'll have the post up Sunday night!) You just need a before picture and the after to join us. Wooeee, I love a party!! Love the SPOOKY sign! Did I miss that earlier? I also love the new look. Very fancy! The $6 on the SPOOKY sign, was definitely worth it... IT ROCKS!!! ALL of your Halloween decor is just awesome!! Oh how cute! Love how you made your own signs and stuff, cool! Your blog makeover is awesome! So many cute things. Love that meatloaf hand. I think I'll make that after Halloween just to freak the family out! Wanted to be sure to say that I also LOVE the new blog makeover. Very nice. Love the Halloween decor -- GREAT stuff, and that it's on the cheap makes it all even better. Your spooky sign is adorable. I love it. I want one. Looking forward to seeing your Christmas project! 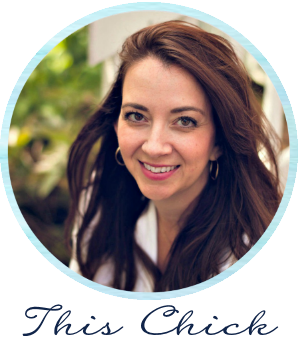 Your new blog design is STUNNING and so "you"! Luuuurvvve it! All of your Halloween ideas are so awesome! I still can't believe the prices you are able to create such amazing things with. Target santa towel? I almost got that! It makes me excited for halloween next year :) Just too much going on and ZERO decorations for this Halloween - booooo! GREAT HALLOWEEN DECOR! AND I LOVE THE NEW LOOK OF OUR BLOG...SO CHIC! BEAUTIFUL! Love the decor! I have the same tomestones from the dollar store! I put mine on the wall in the livingroom...our livingroom is painted bright orange so it worked perfect with the Halloween theme! Thanks for sharing your great ideas! You are one creative gal! Love your new look!!! Your home is beautiful! I love those labels. And I want those stickers you got at Homegoods! I need them. I have been so busy with my burlap obsession that I haven't been shopping in weeks. I am going over there tomorrow to see if they have any left! Love the new look, just so perfectly beautiful! Love the Halloween decor, it's very tasteful and chic. I like the BOO sign you made with the letters and half off paper. Very cute! :) Interested to see your Christmas project! oooo great job!!!!!! i cant wait to hit up the after holiday sale! i go every year. and i always find really good deals. You simple HAVE TO come to MN! We have a store out here you would adore - AxMan Surplus. It is filled to the brim with crafty/bizarre/AWESOME stuff for dirt cheap. I LOVE the new look BTW! It is "GORG"!!! YAY! So excited to start the Christmas crafts! Just wondering, how did you stick the black felt shapes to the windows? Love all of your ideas. Please keep them coming. The DR rocks. I love your blog but have a hard time opening it. Has anyone else told you this? I don't have problems with other blogs. Anyway, love your Halloween decor, especially the spider web. If you like vintage-looking labels, you should check out iDIY (www.i-do-it-yourself.com) It's a wedding website but has lots of freebies that you can update for your own projects, like some great apothecary jar labels! You would like it I think. I LOVE LOVE LOVE every single one of those projects!! I'm almost mad at you for not posting them sooner so I could make a few for halloween this year!! :) SOOO AWESOME! I can't wait for next year! Love your new blog look! The labels are so cool. I googled and found some (maybe the same ones?) at http://www.flickr.com/photos/lovemanor and I'm thinking of making my own for next year. I love all of the adorable ideas you have. Thanks for sharing. Hey there, I wished I had found your blog before today. You show so many nice and inexpensive Halloween decor Ideas I just gotta show them to my son, who loves Halloween more than Christmas. Keep going gal, I'll return to your blog! For the next Halloween I hope I can get a few more Halloween Decor items in my shop too. Happy Halloween to everyone and the most to our first Grandson Brock Austin Tanner for his very first Halloween. I love all your decor and the price is great to.